Elyese never felt like she belonged anywhere or really knew who she was. She had been told she was Native American, but had no way of knowing the truth. But Elyese’s FamilyTreeDNA story started to make more sense when, at 24 years old, her birth parents found her. They were teens when she was born and had given her up for adoption. Later they married, and it turned out they had been searching for her all this time. They had a wonderful relationship for the remainder of their lives, but in the end, Elyese still didn’t know exactly who she was. That changed when she took her first DNA test. It showed that she had very little Native American ancestry at all. Confused, she uploaded her results to the FamilyTreeDNA database, and discovered everything she thought she knew was wrong. Suddenly, she was connected to multiple family lines. She had deep roots going back with several Scottish family surnames. She found that she shared DNA with presidents, poets, inventors, women’s rights leaders, and even royalty. 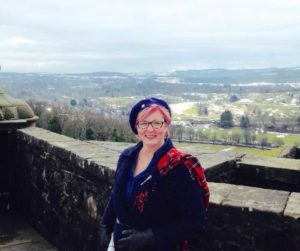 Elyese decided the best way to get in touch with her roots was simply to go there, so she packed up and headed to Scotland to see the place where her ancestors had come from. Elyese and her ancestor, Lady Margaret Stewart Knox. People tell her she has the same nose as Lady Stewart, the wife of John Knox, who is one of her grandmothers. Of her experience, she said, “Thanks to FamilyTreeDNA, I will never feel lost again.” For more posts like Elyese’s FamilyTreeDNA Story, check out Donna G’s FamilyTreeDNA story.